Uma Khurana, the government school teacher, shown in a fake sting operation running a prostitution racket, is again being questioned by the crime branch. The Bhartiya Janata Party (BJP) rallied at the historic Red Fort in protest against the non-opening of the park developed in front of the Fort. Additional chief metropolitan magistrate Alok Aggarwal today sent Prakash Singh, the Live India TV reporter, to police custody till September 13 for further investigation into the case. Delhi Chief Minister Sheila Dikshit has instructed Discoms, DJB and MCD to ensure adequate supply of power and water and ensure arrangement of sanitation and cleanliness during the holy Ramzan month which starts from Thursday. Three television reporters were arrested from a Jharkhand MP’s official residence in North Avenue on Monday, for allegedly threatening and blackmailing him and three other MPs, over a sting operation, police said. Delhi Finance, Planning & Power Minister Dr. A.K. Walia has asked Discoms to submit a detailed list of those colonies where power cut for more than 30 minutes was carried out during night hours. In a fit of rage, a man strangled his wife, three children, and later committed suicide by hanging himself from a noose in NSEZ in Phase-II Noida. The man was a security guard in a factory closed down for years. In the absence of a suicide note, the police are trying to figure out the cause of this tragedy that took place on Monday. About half a dozen women and a dozen other passengers were seriously injured in violence in Delhi-Hapur shuttle train on Monday. Lathis, iron chains, saryas and sharp-edged weapons were used in the violence. It all started when some anti-social elements molested girls. The floor of the train compartment was splattered with blood and broken glasses used by miscreants in the attack on commuters. The administration’s decision to seal unauthorised tubewells a couple of days ago, resulted in a severe water crisis today leading to more than a thousand residents taking to street in protest against the authorities in the district. 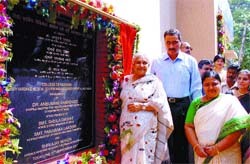 The residents of Mujesar, one of the highest populated village of Ballabgarh assembly constituency in Faridabad district, are a happy lot as their dream of a community centre has come true with Chief Minister Bhupinder Singh Hooda laying the foundation stone of it last Sunday. Four burglars were arrested in two separate cases in the Capital. With the arrest of Aakash Mahani, the police claimed to have worked out a case of burglary in Dilshad Garden. Determined to improve the quality of nursing education in the country, the government plans to set up four regional colleges of excellence with the state-of-the-art facilities. Three autolifters were arrested in two separate cases in the Capital. The police arrested one Anil Rawat, as part of their drive against autolifters. The questioning began a day after she procured bail from the Delhi High Court. The questioning began at around 11.30 am at the R.K. Puram branch. A senior police official said that it was important to question her, as there were several questions in the sting video that needed to be answered. After coming out of the Tihar Jail, Khurana wanted to take rest for a couple of days. However, the court turned down her appeal and asked her to appear for an interrogation today. Further, the High Court has sought the diary of the episode from the police by September 12 and has asked the Delhi government to review her dismissal from the job. The court observed that Khurana was more of a victim, rather than an offender. However, the police has clarified of not relieving Khurana, as the case against her still existed. Party secretary Vijay Goel, who was instrumental in developing the ground into a park, four years ago, led the rally. Addressing the rally, Goel alleged that the UPA government in the Capital had closed the park without mentioning any reason. The development of the park started in 1999, when the ground was under the defense ministry and, later, was given to the MCD. Finally, it was handed over to the Archaeological Survey of India. But, after the ground was developed into a park, it was not open for the public. This shows the government’s step-motherly attitude towards the residents of the walled city. They do not have any park nearby, said Goel. The government has no right to deny accessibility to the park, Goel added. He claimed that he would not relax till the park was opened for the public and that too free of cost. Residents of Chandni Chowk and other areas of the walled city live in congested lanes. They are forced to go to India Gate or other parks for fresh air. If this park is opened for them, they need not to go parks located at long distance, Goel said. material has come on record during the investigation. It would be incomplete without confrontation of both the accused, he said. Opposing the police remand, Murari Tiwari, counsel for Singh, submitted that the prosecution implanted certain evidence against him. No fresh fact came on record after his arrest, he contended. “We are indeed co-operating with the investigating agency so there is no need for taking him into police custody,” Tiwari argued. The Crime Branch had arrested Singh on September 7 and booked him under various sections of the IPC, including those relating to cheating and criminal conspiracy. Singh, a reporter of Live India that aired the sting operation last week, was arrested after it reportedly turned out that the girl who appeared in it making allegations against Khurana was not a student but an aspiring journalist. The Delhi High Court also issued notices to the city government and police after taking suo motu cognisance of media reports that the sting operation was fake. Dikshit today chaired a meeting which was attended by Power Minister A.K. Walia, Development Minister Raj Kumar Chauhan, Transport Minister Haroon Yusuf, Dy. Speaker Delhi Vidhan Sabha Shoaib Iqbal, DJB CEO and senior officers from Discoms and MCD. The meeting was held to take stock of preparations for Ramzan. The Chief Minister instructed all departments concerned to take immediate and appropriate action to ensure basic amenities such as power, water and sanitation in minority dominated localities. She exhorted Discoms to maintain uninterrupted supply of power and avoid any power shedding. Similar instructions were also given to the DJB and it was directed to maintain supply of water especially in wee hours. Dikshit would personally be taking round of minority -dominated localities to assess actual position of basic amenities during this month. The MCD has also been asked to concentrate on sanitation and cleanliness by deploying sufficient number of workforce. “We have arrested Pankaj, Rajiv Patel and Ratan Deep Gupta for allegedly threatening and blackmailing some MPs. They were arrested from the residence of Jharkhand MP Rameshwar Oraon of Lohardaga constituency,” a senior police official said. The fourth accused- Sunil Tiwari - is absconding, the police informed. “One of the accused posing as S.S. Rawat, a secretary in the ministry of tribal affairs called me. He said that he would give me five per cent commission, if I helped him in getting a project worth Rs 18 crore,” Oraon told IANS. “He first called me on Thursday and arranged a meeting with me on Saturday. I checked with P.R Kyndiah (minister for tribal affairs) and discovered that the man was fake. I informed the police about it and the trio was arrested today. The police also recovered some electronic gadgets that they had attached to their bodies. They said that they were working with a private Hindi news channel,” he added. Oraon also told IANS that the men had earlier threatened three other MPs from Jharkhand- two from the Congress and one from the Jharkhand Mukti Morcha. Police sources informed that the trio posed as ministry officials and had been meeting the three Jharkhand MPs for quiet some time. They demanded money from the MPs. The trio had earlier conducted sting operations for some TV channels. He has further directed Discoms to prepare a comprehensive guidelines relating to redressal of grievances and chalk out an action plan to offer one time amnesty scheme to customers to encourage installation of fresh meters in cases of power theft, faulty meters and tampering. He also exhorted Discoms to develop a customer-friendly approach and take immediate confidence building measures. Dr. Walia was today chairing a meeting of all the three Discoms, DERC and senior officers of Power Department, which was attended by CEOs of Discoms, Director (Operation) DERC and others. Dr. Walia told the officers concerned that load shedding/power cuts should be avoided and wherever necessary the details along with proper justification be submitted to him at regular intervals. He reminded Discoms that their primary function was to provide un-interrupted power supply to all customers and generate revenue as distribution companies were earning substantial percentage of profit on supply of every unit of power. The companies have also been directed to ensure delivery of bi-monthly bills to the customers. The customers should not be charged on the basis of average/estimated consumption. Thirty-five-year-old-Joginder, originally of Muzzafarnagar was a security guard in a factory of A-98 in NSEZ which had been lying closed for the last many years. Joginder strangled his wife Latesh, 30, Jyoti, 7, Deepak, 6, and Aarti, 5. Thirteen-year-old Annu, daughter of his brother-in-law Jagmender Singh of Barant also lived with him, the police said. His wife Latesh also worked in a company in NSEZ. When Annu returned from her school in Bangel in the afternoon, she found the door of the house closed. She then went to her aunt’s factory and learnt that Latesh had not reported there for the day. She again went back to the factory and peeped into the house from outside. She was shocked to see Joginder’s body hanging from a noose. When police opened the door, Latesh and her three children were found lying on the ground clutching to her, in their school dress. All the four were dead. The police investigations are in progress. Even the GRP jawans, who came to the rescue of the commuters, were attacked. The wounded have been admitted to private hospitals. Due to the clash, the shuttle train had been detained at Mussori station for more than an hour. According to police, a group of 54 students, including girls and staff of Amroha and Gajraula American Institute of English Language had gone on a visit to Delhi on Monday. As the train left Ghaziabad at 7.30 pm for Hapur, the daily commuters of Dasna, Mussori, started teasing and molesting the girls. When their companions opposed it, they were beaten up. The miscreants were then reported to have alerted their friends at Mussori and as the train reached there, a large number of people attacked it. The anti-social elements who had boarded the train compartments started assaulting the women passengers, tearing off their clothes. The miscreants also threw stones on the train. Nadim Saif, a passenger, alleged that the mob had pulled out some passengers. Nadim Saif, Jyoti Rastogi, Rahul Aggarwal, Shanti Alam, Javed, Kapil Sidhu, Prasna Sanjeev Singh, Kalpana Solesh and others were among one and a half dozen passengers wounded in the attack by hooligans. All the injured were admitted to a private hospital. Two GRP jawans who opposed the assailants were also thrashed. After about half an hour, the police from various police stations reached Mussori station under SP Rural, Jagdish Sharma, DSP Neeraj Pandey and R.K. Gautam. The train could only move after one and a half hours. Ugly drama by the public started unfolding at about 10 am and stretched to 1 pm. The irate public blocked roads at several places, barged into complaint centres of Municipal Corporation of Faridabad (MCG) in Nangal Enclave. Residents in large number blocked the roads near the headquarters of MCF. Women broke earthen pots outside the headquarters of MCF symbolising their anger at the failure of the civic body to supply water. Residents broke the police cordon and entered the premises of the MCF main office shouting slogans against all those who represented the government and the MCF. A good number of them had lathis. The situation was apparently explosive, but the police turned up and took control of the situation. The gravity of the situation was such that the district police chief reached the MCF office. The public relented after the authorities, including Brahmawati Bhadana assuring the public that water would be immediately supplied to the affected colonies by tankers. The residents alleged that they had been facing acute shortage of water for the past three days. The other places where the public blocked roads were Nangal Road, Air Force Road, Janata Colony. The explosive situation resulted out of the district administration sealing about 60 illegal tubewells in the MCF areas, a couple of days back. The reason for this hash measure was that the mafia sells water drawn from these tubewells to Delhi, especially to factories. While a good number of miscreants owned the tubewells, others who were in this business purchased water in whole sale from the tubewell owners and sold it on retail basis in Delhi. The problem arose as major areas of about half dozen colonies, including Dabua Colony, Sanjay Colony, Nangal Enclave, Parvariya Colony, do not have water supply pipeline. The others do not have adequate supply of water. In such a situation, the residents mostly purchased water in the retail market from the mafia (at Rs 5 per can). The sealing of the illegal tubewells resulted in stoppage of the supply. The administration also checked the operation of such tankers. Thousands of tankers do illegal business. According to an estimate, each tanker does business of about Rs 2,000 per day. Such illegal business has been in operation for the past many years, only to gain momentum recently. The government had to cut a sorry figure as the affected colonies fall in NIT assembly constituency represented by the minister for local bodies A.C. Chaudhary. Coincidentally, the ugly event has taken place only a few days after A.C.Chaudhary was sworn in the Council of Ministers. 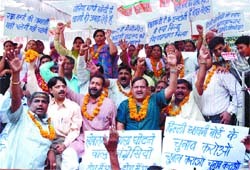 The residents also raised slogans against A.C.Chaudhary. Ministry of Human Resource Development, Department of School Education and Literacy, Government of India ,was the chief guest on the occasion. The proposed community centre and a modern park will be developed on a two-acre land at an estimated cost of Rs 1 crore. A senior resident of the village attributed the positive development to parliamentary secretary of Haryana Assembly, Sharda Rathore, who is a Congress MLA from Ballabgharh assembly. The residents say that the Chief Minister accepted their demand voiced through their MLA. The residents had a longstanding grouse that although the village played an important role in Ballabgarh assembly’s electoral politics, it had no decent place where they could hold wedding parties. Also, there was no park where the old people and children could spend some time. The villagers say that the village was strategic as there are many industrial units in it. Sharda Rathore to the ministry of education, in addition to the portfolio of Labour and Employment. A.C.Chaudhary, who represents NIT assembly segment in Faridabad district, and who has been recently inducted in the council of ministers, was also present on the occasion. Speaking in the public function, Hooda said that Chaudhary, a native of this district, was made the minister with the sole purpose of shaping and directing the modernisation and progress of Faridabad. Faridabad, once the most developed industrial city of Haryana, lost the momentum of development in the past few years, he added. He said that the government was expecting huge investment from various quarters in the state in the coming years. This will create ample avenues for employment for the youths of the state. Kavita noticed that her jewellery was being stolen at short intervals. She decided to catch the thief and installed a CCTV camera in the house. One boy entered the room and opened the safe. One of the family members watched this on the TV in the next room. He tried to lock the boy inside the room, but he escaped by jumping from the balcony. Later, Kavita identified the accused as Aakash, son of one of their family friends. The accused was arrested and Kavita’s jewellery was recovered. In another such case, the northeast district police, to work out a case of Dilshad Garden, arrested three boys. Speaking at the inauguration of the College of Nursing of the Lady Hardinge Medical College and Associated Hospital, here today, Dr Ramadoss said that a provision of Rs 319 crore has been proposed for the XIth Plan for strengthening nursing education in the country. He said that nursing educational institutions will be strengthened to improve the quality of training and additional nursing educational institutions will be established under the National Rural Health Mission. The police received an information that an autolifter was expected to visit Okhala Phase II yesterday. A trap was laid and Rawat was apprehended with a motor cycle. He could not reply satisfactorily regarding the ownership of the vehicle. According to the police, the accused was one of the key persons, who delivered the stolen vehicles to northeast states. Three motor cycles were recovered from his possession. In yet another case, the southwest district police nabbed two juvenile auto lifters. The alleged persons were riding a motor cycle and were asked to stop at a check post. The duo could not produce any document related to the ownership of the vehicle. During investigation it was learnt that the motorcycle was stolen from Delhi Cantt.